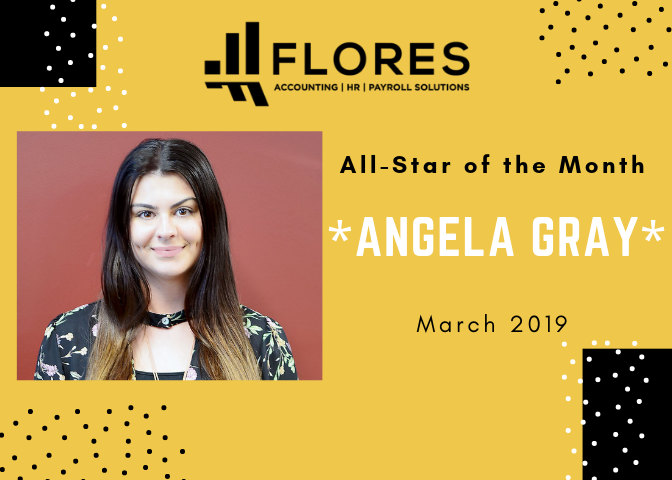 We are pleased to announce our March All-Star winner *drumroll please* — Angela Gray! Angela has consistently worked hard for her clients, going above and beyond the expectations of the job. She has recently transitioned and taken on a new client group, learning her new companies while ensuring that her former locations are handed over properly and all the particulars of the work is passed on in her training the replacement associate. She is also a fun and positive coworker to be around, always bringing joy to the workday no matter the load on her desk. She is respected by her clients, coworkers, and manager for the work she does and the attitude she brings to the job. Angela is an amazing addition to our team. We are so happy to have her on board and are truly excited about her future here at Flores. We appreciate all of her hard work and can’t thank her enough for all she does.